24 • FOODSERVICE EQUIPMENT & SUPPLIES • JANUARY 2014 Chocolate lovers have a new treat coming soon to a mar- ket near them. 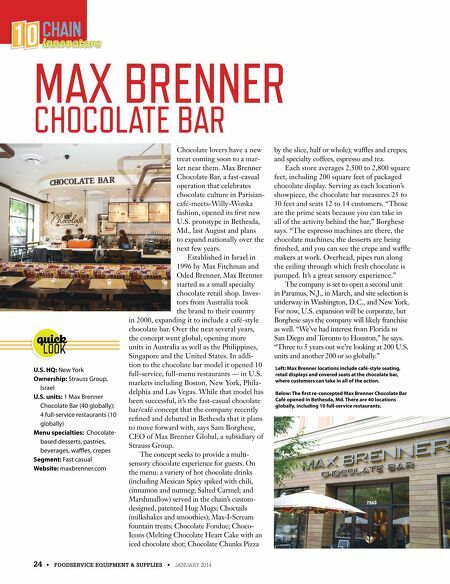 Max Brenner Chocolate Bar, a fast-casual operation that celebrates chocolate culture in Parisian- café-meets-Willy-Wonka fashion, opened its frst new U.S. prototype in Bethesda, Md., last August and plans to expand nationally over the next few years. Established in Israel in 1996 by Max Fitchman and Oded Brenner, Max Brenner started as a small specialty chocolate retail shop. Inves- tors from Australia took the brand to their country in 2000, expanding it to include a café-style chocolate bar. Over the next several years, the concept went global, opening more units in Australia as well as the Philippines, Singapore and the United States. In addi- tion to the chocolate bar model it opened 10 full-service, full-menu restaurants — in U.S. markets including Boston, New York, Phila- delphia and Las Vegas. While that model has been successful, it's the fast-casual chocolate bar/café concept that the company recently refned and debuted in Bethesda that it plans to move forward with, says Sam Borghese, CEO of Max Brenner Global, a subsidiary of Strauss Group. The concept seeks to provide a multi- sensory chocolate experience for guests. On the menu: a variety of hot chocolate drinks (including Mexican Spicy spiked with chili, cinnamon and nutmeg; Salted Carmel; and Marshmallow) served in the chain's custom- designed, patented Hug Mugs; Choctails (milkshakes and smoothies); Max-I-Scream fountain treats; Chocolate Fondue; Choco- Icons (Melting Chocolate Heart Cake with an iced chocolate shot; Chocolate Chunks Pizza by the slice, half or whole); waffes and crepes; and specialty coffees, espresso and tea. Each store averages 2,500 to 2,800 square feet, including 200 square feet of packaged chocolate display. Serving as each location's showpiece, the chocolate bar measures 25 to 30 feet and seats 12 to 14 customers. "Those are the prime seats because you can take in all of the activity behind the bar," Borghese says. "The espresso machines are there, the chocolate machines; the desserts are being fnished, and you can see the crepe and waffe makers at work. Overhead, pipes run along the ceiling through which fresh chocolate is pumped. It's a great sensory experience." The company is set to open a second unit in Paramus, N.J., in March, and site selection is underway in Washington, D.C., and New York. For now, U.S. expansion will be corporate, but Borghese says the company will likely franchise as well. "We've had interest from Florida to San Diego and Toronto to Houston," he says. "Three to 5 years out we're looking at 200 U.S. units and another 200 or so globally." CHAIN CHAIN MAX BRENNER CHOCOLATE BAR U.S. HQ: New York Ownership: Strauss Group, Israel U.S. units: 1 Max Brenner Chocolate Bar (40 globally); 4 full-service restaurants (10 globally) Menu specialties: Chocolate- based desserts, pastries, beverages, wafes, crepes Segment: Fast casual Website: maxbrenner.com quick LOOK Left: Max Brenner locations include café-style seating, retail displays and covered seats at the chocolate bar, where customers can take in all of the action. Below: The first re-concepted Max Brenner Chocolate Bar Café opened in Bethesda, Md. 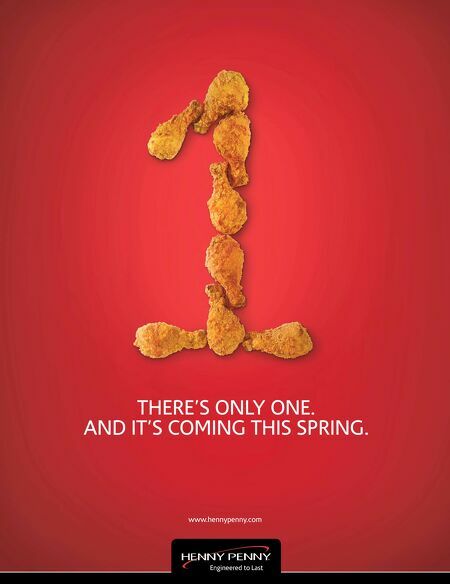 There are 40 locations globally, including 10 full-service restaurants.